Today we’re sharing two versions of savory veggie cakes, perfect for an appetizer or even as a whole meal. Nikki shares her cheesy vegetarian quinoa cakes while Jess shows you how to make spicy lentil cakes. The quinoa cakes are paired with an addicting spicy lemon and garlic aioli (it’s vegan!) that makes it feel like you are eating something way more guilt-ridden than quinoa! 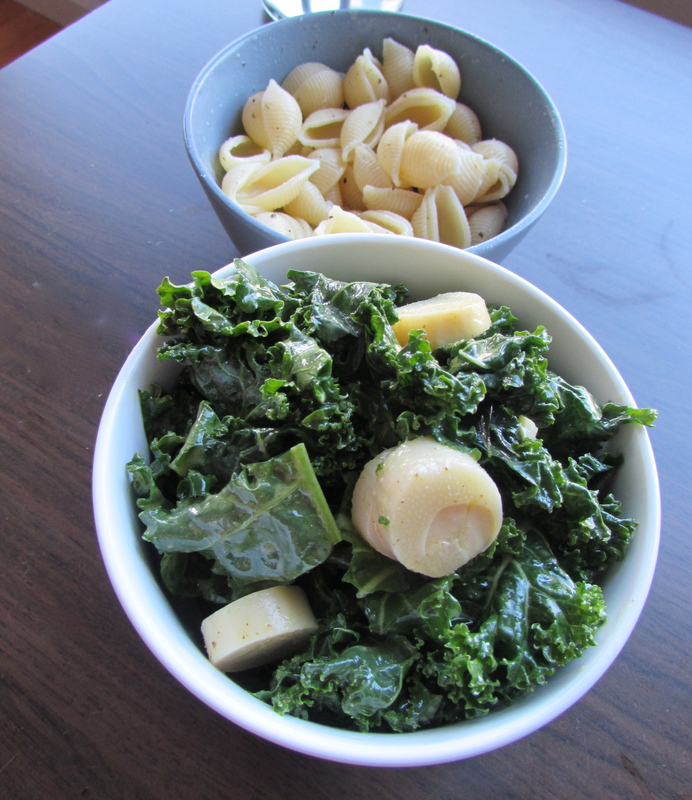 Both are protein and nutrient packed and perfect for a Meatless Monday or sneaking in some veggies. Click the link below to find the recipes! The Superbowl is tomorrow-we’re getting hungry and excited planning our snack menus! So far this week we’ve shared Nachos two ways & Jalapeño Poppers two ways. To conclude snack week we’re sharing another classic favorite, Spinach Artichoke Dip. Jess has veganized the recipe into a creamy, salty, savory fan favorite dip. Plus it’s a little healthier than the traditional version, and Paleo too! I served most of the dip in little ramekins, but then I had a brilliant idea and rolled the remainder of the dip inside of Pillsbury crescent rolls. Little pockets of breaded, creamy dip-yum!!! Preheat oven to 350. In a medium mixing bowl, mix together artichoke hearts, spinach, onion, garlic and generous sprinkling of salt, pepper and red pepper flakes. Toss to combine and set aside. In a food processor, blend together remaining ingredients for about 1 minute or until smooth. Pour the mixture into a small pot or saucepan and heat over medium heat, stirring occasionally. When the sauce begins to thicken, stir continuously, turn down the heat a tad, and continue for about 2 minutes. Tapioca starch does amazing things to make sauces stretchy and thick! Pour the sauce over the veggie mixture and stir well. Add any spices you feel are lacking and pour into a baking dish, divide into ramekins, or roll into Pillsbury crescent rolls. For the crescent rolls, I laid a piece of dough out flat, spooned a small amount of dip at the base of the triangle and then rolled it forward as you normally would with a roll. The bake time will vary according to your dish, the crescent rolls take about 15 minutes to bake, while the ramekins took about 40. Keep your eye on the oven, you want the dip to get nice and golden on top. Serve warm with bread, crackers, sliced carrots or bell peppers. If you’re looking for more snack ideas try our popcorn, potato skins, or brussels sprouts! Hi readers! Today we continue our Thanksgiving Series. As we work our way through the meal, having already shared our Pomegranate Mule and Twice Baked Potato Casserole, it is almost time for the star of the show- the turkey! 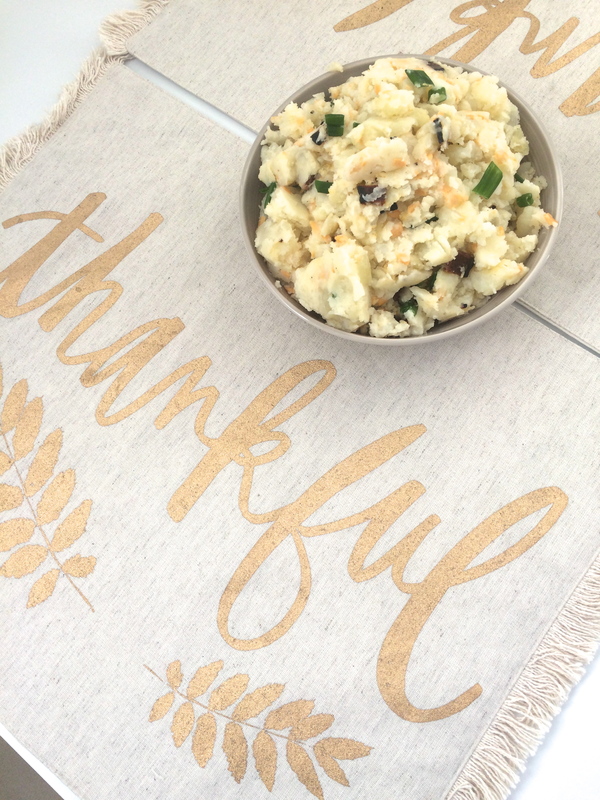 While we won’t be sharing a turkey recipe with you this year (who has time for that?!? 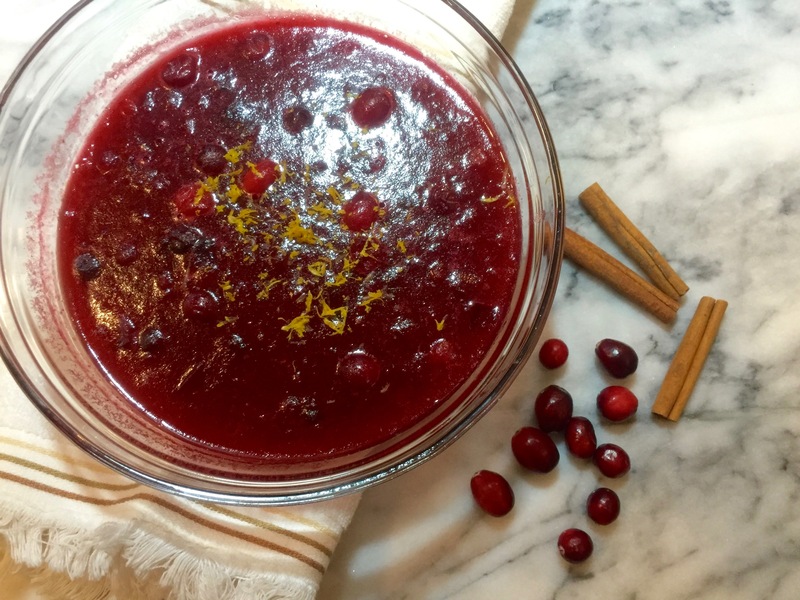 ), we are sharing our favorite homemade cranberry sauce that is sure to be a most-loved accompaniment to your main dish- turkey or tofurkey! Personally, I love this sauce so much that I even use it as a spread for biscuits, why not? 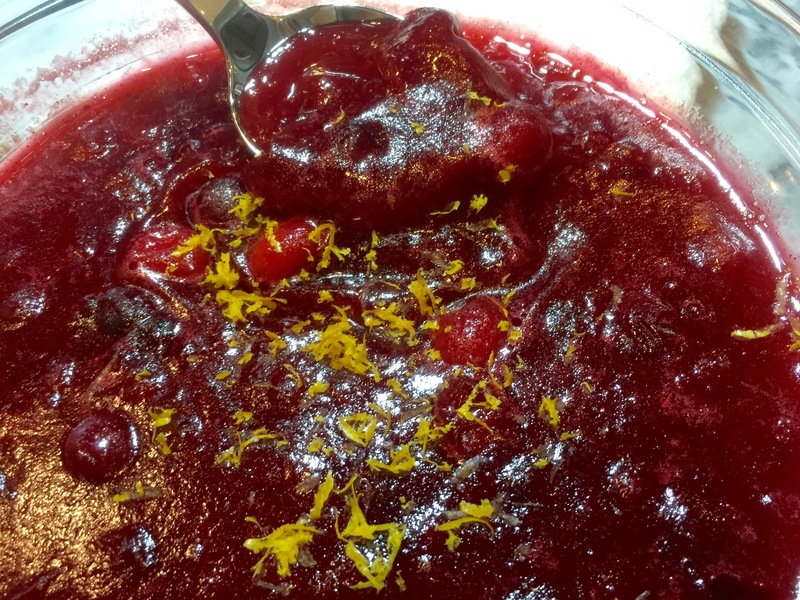 So ditch that sketchy can of cranberry “relish” and whip up this super easy sauce that uses fresh oranges and a touch of cinnamon. I cannot tell you enough how easy this is, and best of all, it can be made several days ahead of time- yay! That leaves more time for enjoying the company of your guests on Thanksgiving rather than slaving over the stove the whole day! First, juice the oranges until you have 1 cup of juice. Pour the orange juice and 1 cup of sugar in a medium saucepan over medium heat. Bring to a boil. Stir occasionally until sugar is dissolved. Then, reduce the heat and let simmer for 5 minutes. 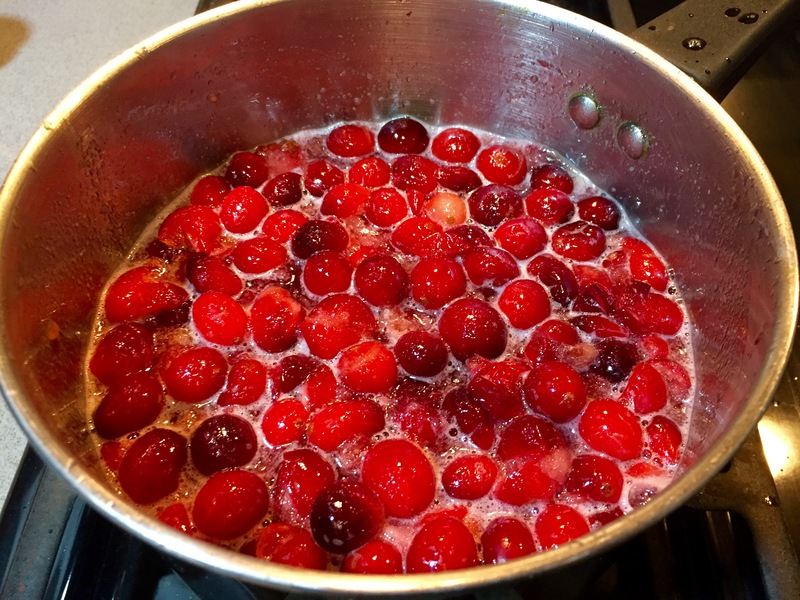 Next, stir in the cranberries. How gorgeous are those!?! 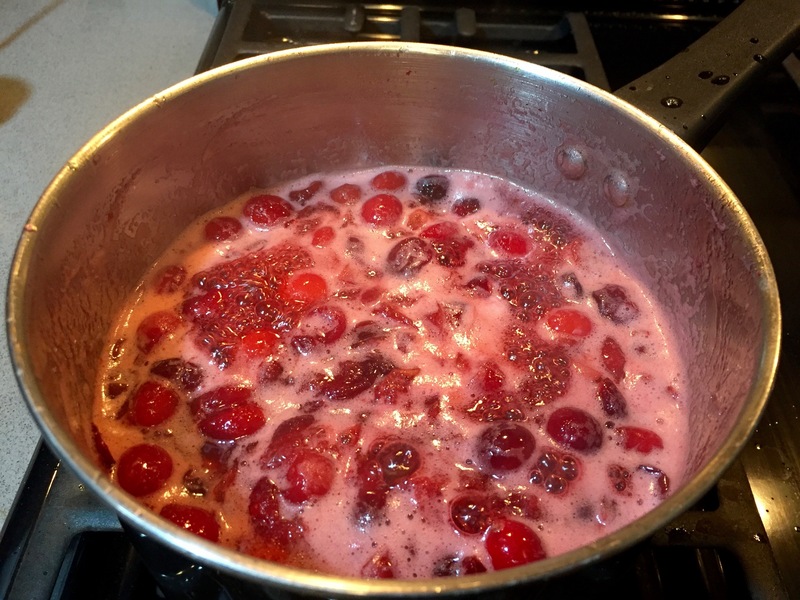 Continue to stir the cranberries to avoid burning. They will keep popping and the sauce will thicken. 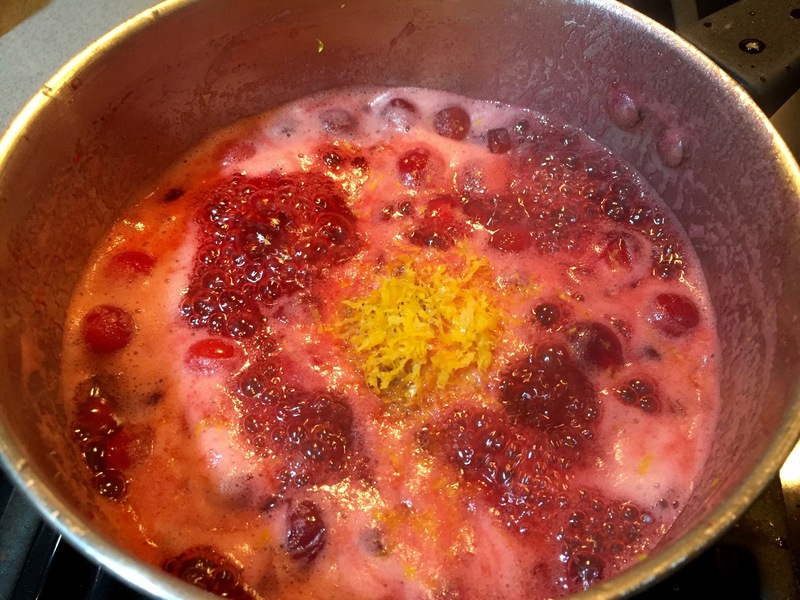 Once the sauce looks like this (above), add the zest of one orange and the cinnamon. 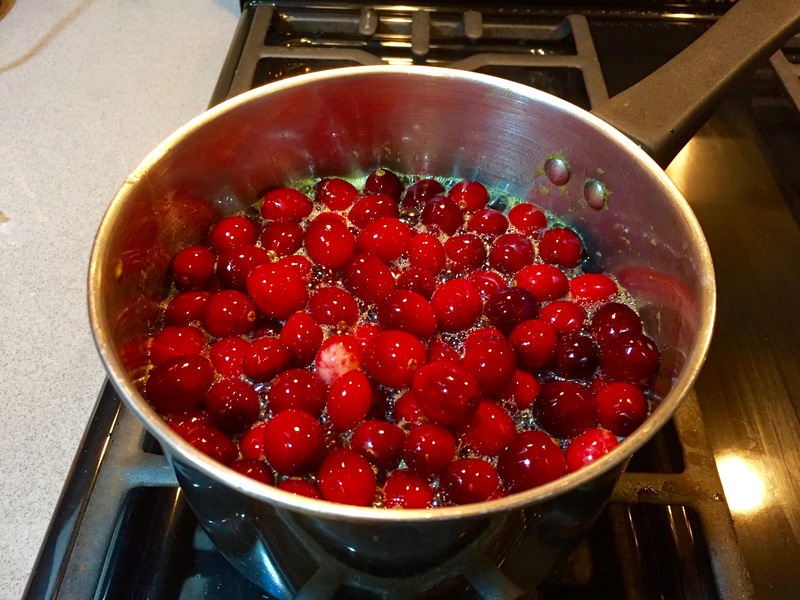 Once most of the cranberries are popped and it has a sauce-like consistency, remove from heat and transfer to a bowl. 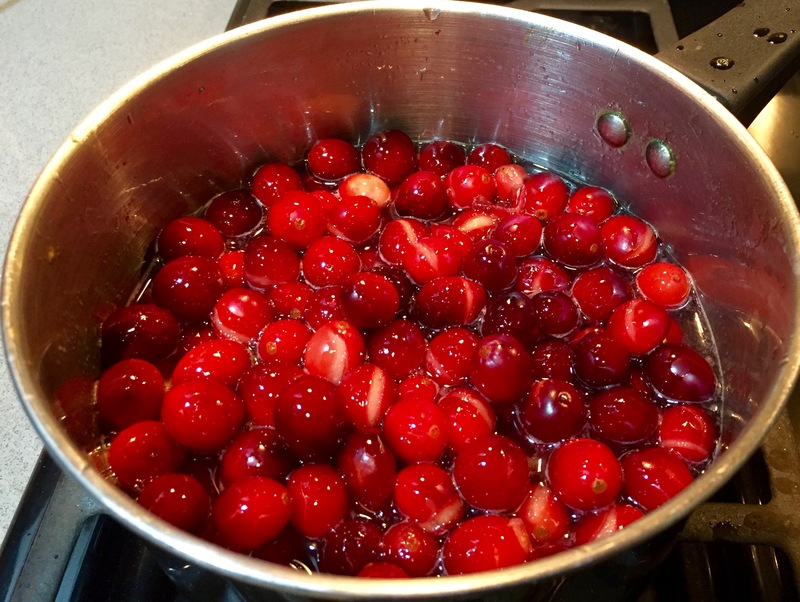 I like to leave a few whole cranberries for texture so don’t worry if all of them have not popped and reduced. Transfer the sauce to a bowl and refrigerate until you are ready to eat. The sauce will thicken as it cools. Garnish with fresh orange zest (optional). Enjoy! I’m so excited to share quite possibly my favorite dish ever! I grew up eating the omnivorous version of this every Thanksgiving and requesting it for any special event. When I first went vegan 4 years ago I was surprised and delighted at how easily this dish was made vegan. 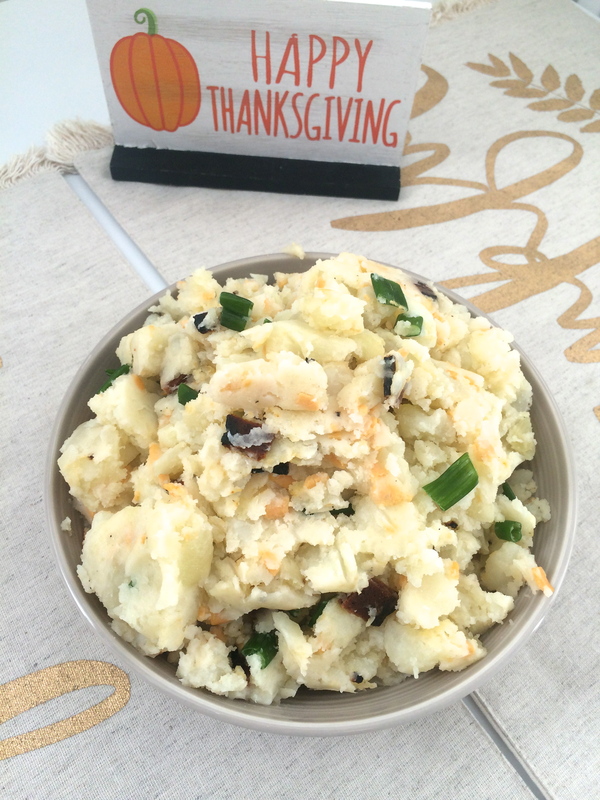 This is a great replacement and step up from the standard mashed potatoes and gravy. 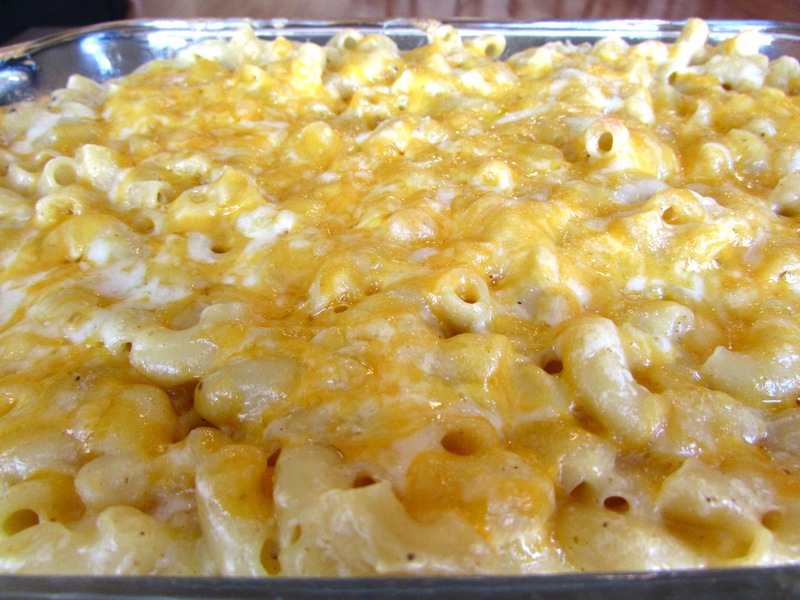 It’s creamy, cheesy, salty and just delicious. All of the ingredients can be adjusted to your taste; increase any ingredient you feel is lacking. 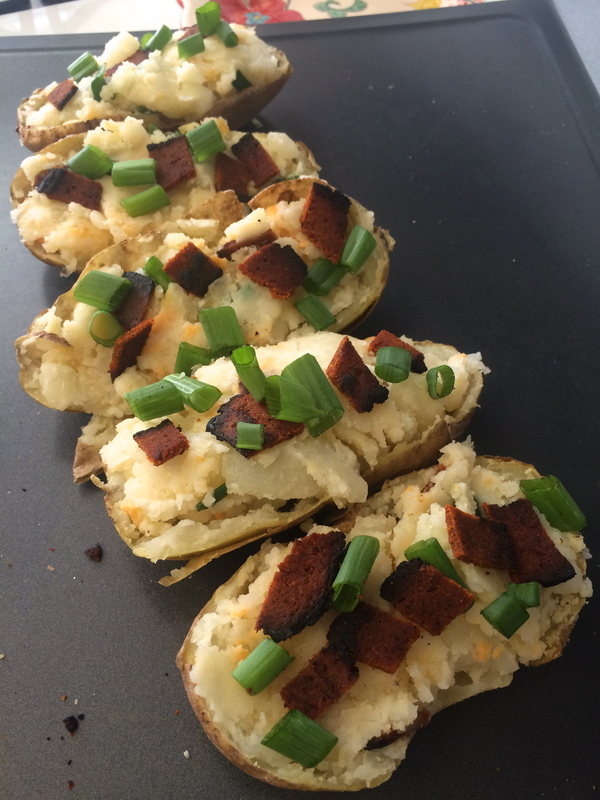 You can also choose to serve this as stuffed potato skins instead of a casserole. I think the skins are great as an appetizer or snack before dinner. Depending on how many people you’re serving (and/or your love of leftovers!) you may want to double the recipe. 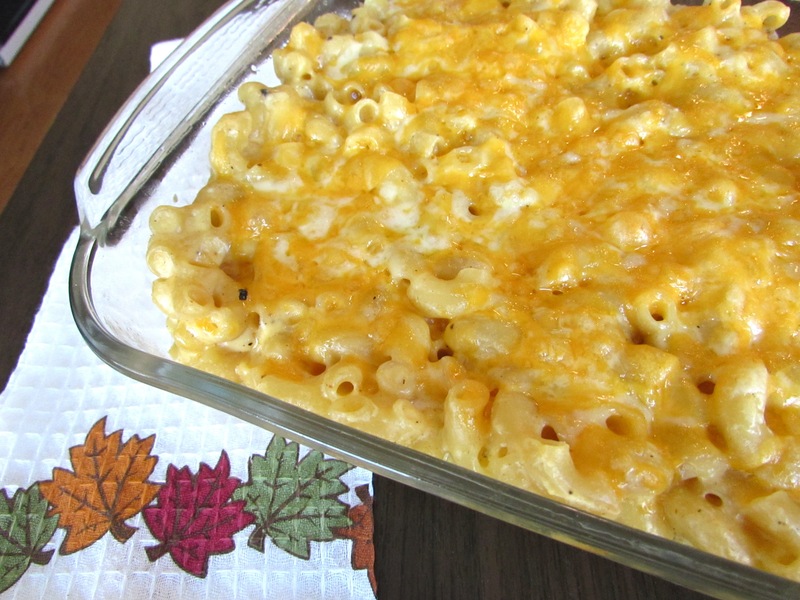 This dish can easily be made the day before Thanksgiving and reheated right before dinner. In case you missed it, on Sunday we started Thanksgiving Series off with a Pomegranate Mule. We have 3 more delicious recipes to share over the next week, so stay tuned! Also check out last year’s Thanksgiving Series where we shared vegan Green Bean Casserole, Nikki’s Mac and Cheese, and a vegan Pecan Pie! 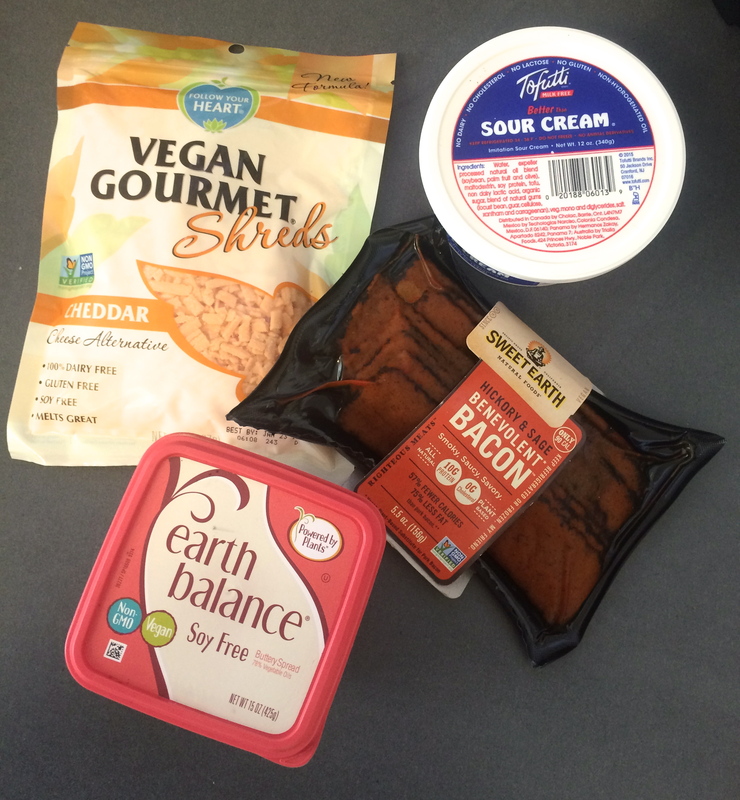 I know faux meat and cheese vegan products can be pretty polarizing. I’ve tested just about everything out there in this recipe, and these are my favorites. Sometimes I leave the bacon out, especially if I can’t find a brand I like. Preheat oven to 400. Wash potatoes well, and poke several deep holes in them with a fork. Bake at 400 for 1 hour. 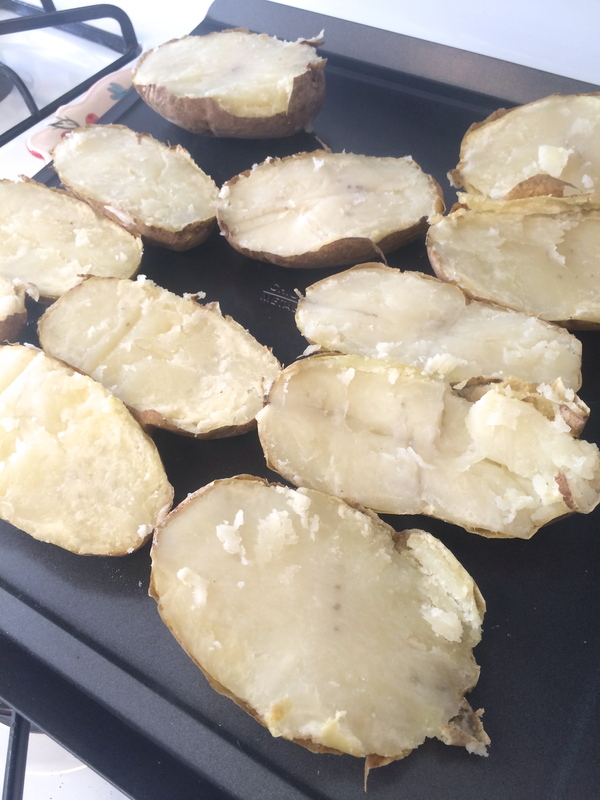 Remove potatoes and allow to cool or use an oven mitt to handle. Lower oven temp to 350. 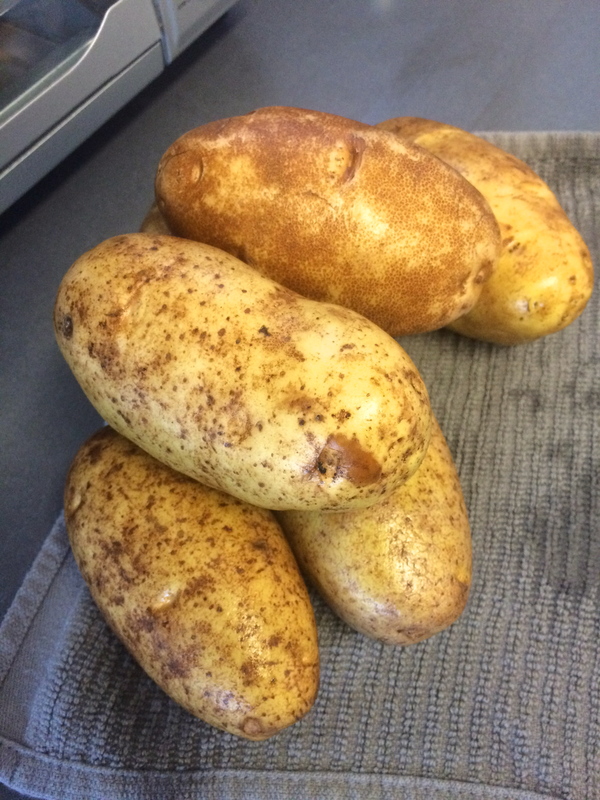 Slice the potatoes in half and scoop the insides out into a casserole dish or mixing bowl. If you’re making potato skins or restuffing the potatoes preserve the skins. 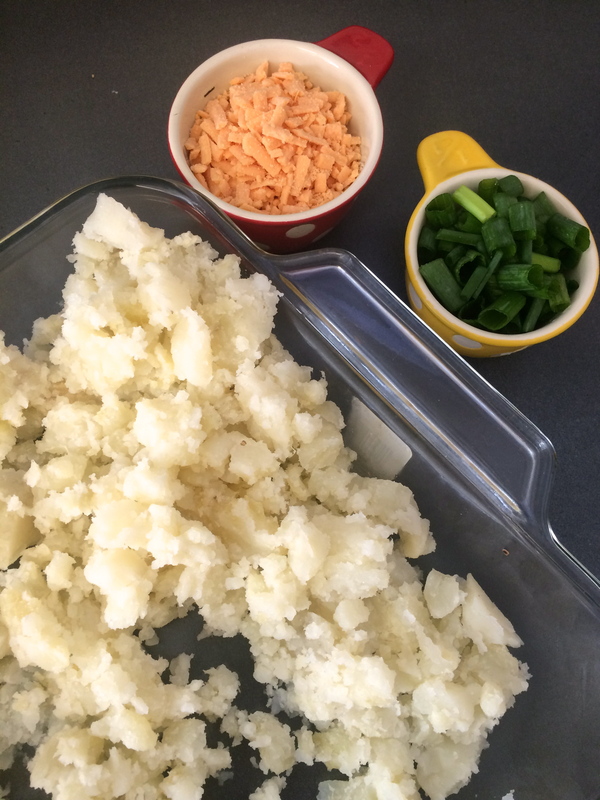 Mash the potatoes with a potato masher or fork. Mix in all ingredients well. If you’re serving right away evenly spread the mixture in a casserole dish and put back in the oven at 350 for about 10 minutes. 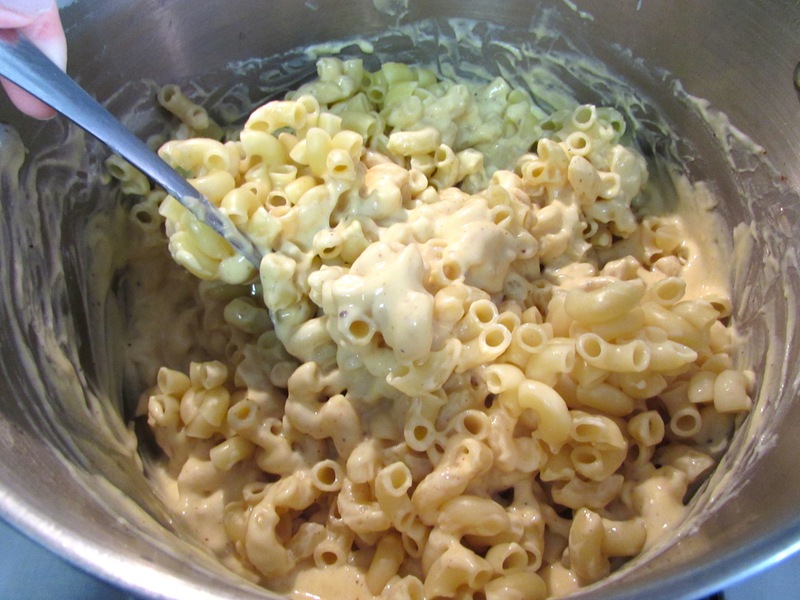 Optionally, you can add extra cheese and bacon to the top before baking. 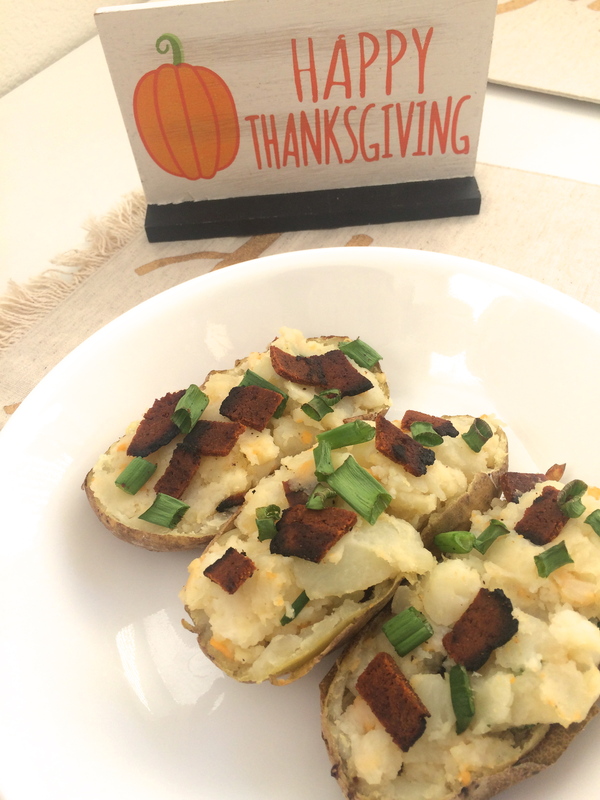 If you’re going the twice baked potato/potato skin route restuff the potato skins with the mixture and add extra chopped bacon and green onions to the top. Pop back in the oven for about 10 minutes. Serve with a side of vegan sour cream or ranch. Hi everyone! Can you believe it is already October? One of the best things about fall, especially Halloween, is curling up on the sofa with a scary movie and a big bowl of popcorn. Today we’re sharing a few popcorn recipes to make those movie nights a little more fun (hint hint, no microwaves involved!). 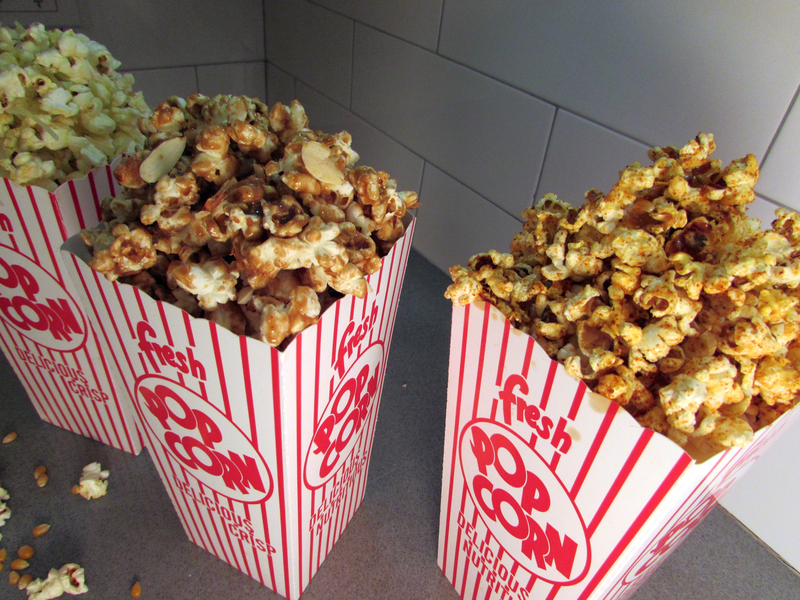 We’re hosting a popcorn party with almond caramel corn, spicy chili lime and truffle parmesan popcorn. Popcorn is so easy to make and is also relatively low in calories. The best part is, all of these recipes are very simple and there is no baking required. So get the scary movie ready and let’s get this party started! First, we will share the recipe for homemade popcorn, which will be used for all of our popcorn topping recipes. Then we will share the recipes for our featured flavors. Enjoy! First things first, the popcorn. We are absolutely NOT microwaving our popcorn! Come on, you are better than that. Microwaveable popcorn is full of chemicals and hidden calories. Homemade popcorn, made over the stove, is healthier and cheaper than microwave popcorn. It tastes better, too! If you haven’t tried it before, it is easier than you may think. I have fond memories of being at my grandmother’s house as a young girl, her house full of kids as Jess and I ran around with our cousins. I admire her for so many reasons, but especially because she was always encouraging her grandchildren to help in the kitchen and share in her love of cooking. Many of the first dishes I ever made were made in her kitchen using recipes passed down over generations. Popping popcorn over the stove with my cousins was a great activity that kept us all entertained and better yet- fed! Choose a popcorn brand that you like and make sure to buy raw popcorn kernels. I have used many different kinds and find that they are mostly the same. Trader Joe’s sells a huge bag that lasts forever and it is only $2- can’t beat that! 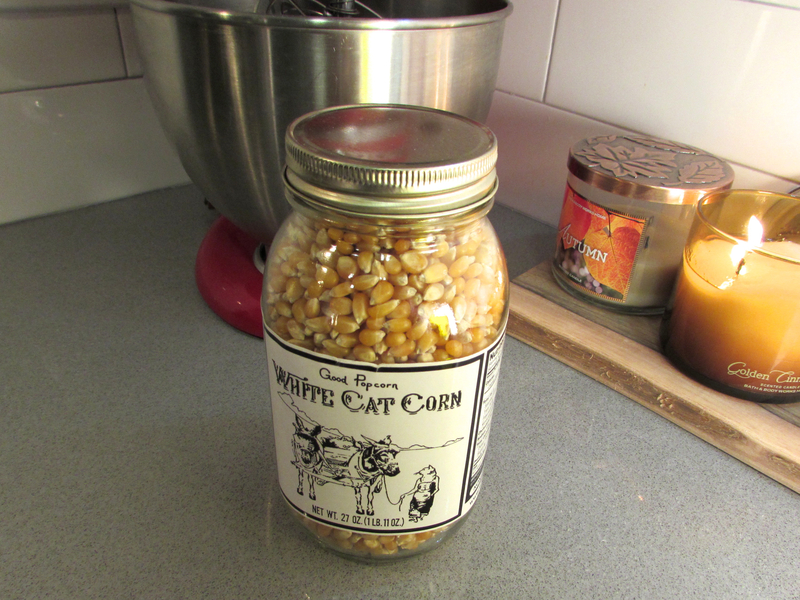 For our popcorn party, I used a brand (White Cat Corn) that I found at Sur La Table, because I always need an excuse to go in that store and because I am a sucker for anything in a mason jar. Any regular raw popcorn kernel will work, though. This makes about 6-8 cups of popped popcorn, enough for two people. Heat the oil in a large pot on medium high heat. Put 2-3 kernels in the oil and cover the pot with the lid. 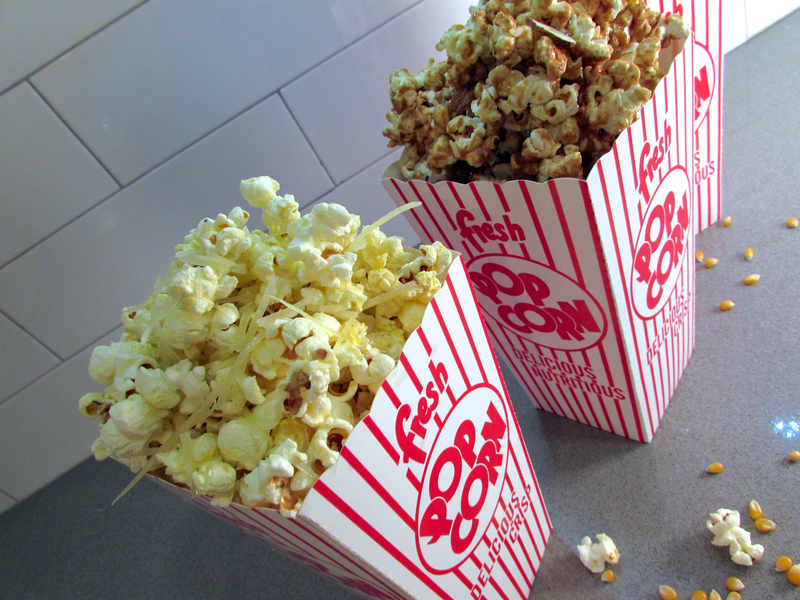 When the kernels pop, add the rest of the 1/3 cup of popcorn kernels in an even layer. Cover the pot with the lid. The popcorn will begin popping soon! Once it starts, gently shake the pot back and forth several times over the burner. This will help ensure even popping and no burnt popcorn. Also, crack the lid slightly so steam can escape. Once the popping slows to several seconds between pops, remove the pot from the heat. Remove the lid and dump the popcorn into a large bowl (Tip- the sooner you do this the less soggy your popcorn will be). almond caramel corn, spicy chili lime, and truffle parmesan popcorn! All hail kale! That’s pretty much my motto in life, and after you try this savory, filling take on caesar salad, I’m sure you’ll feel the same way. It is our third installment of Meatless Mondays this week, following Hearts of Palm Tacos and Fried Rice Two Ways. 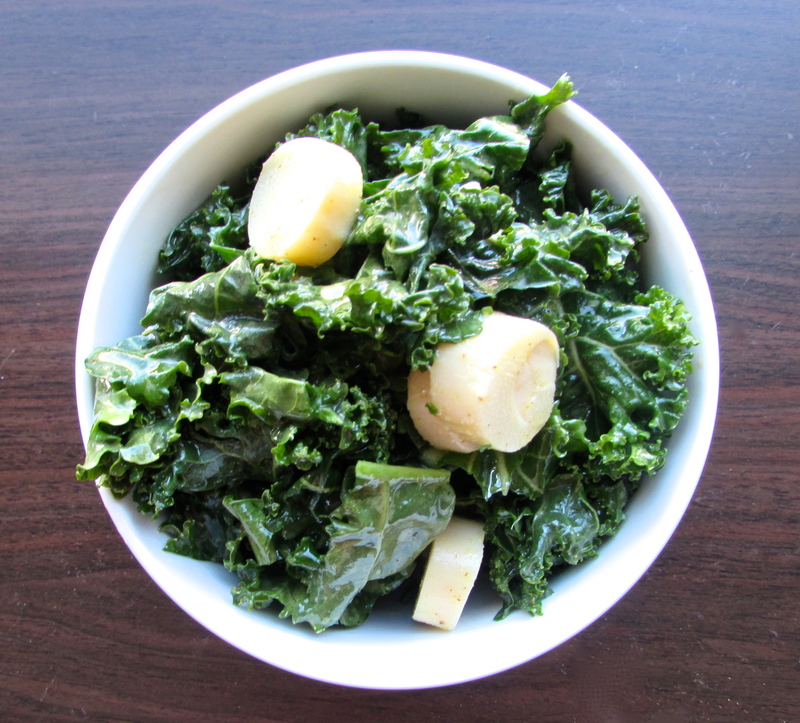 Kale is a very trendy food without a doubt, but it is delicious, packed with vitamins, and very versatile. This salad is vegan, and much healthier than traditional caesar salad, while still maintaining that creamy caesar taste. Make your Monday simple; let’s get started! 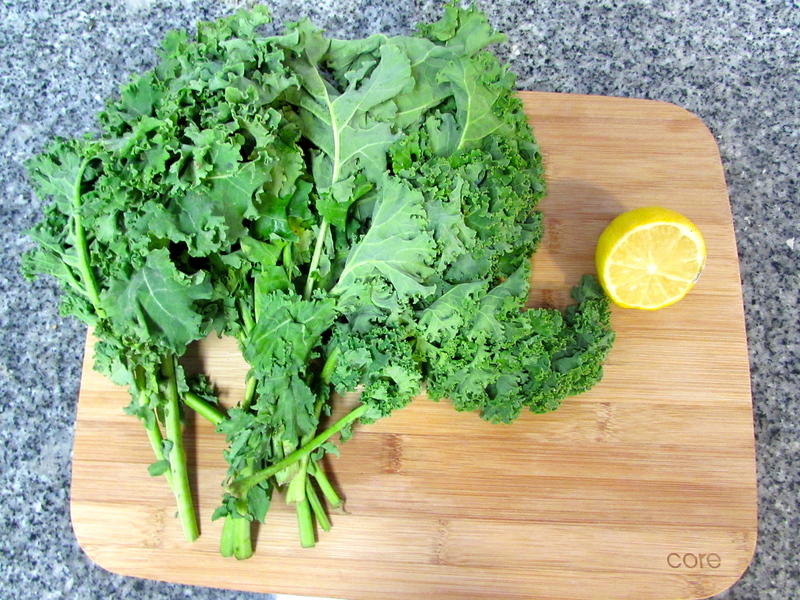 Wash your kale well and trim the stems off. Chop into bite sized pieces and throw in a mixing bowl. Chop your garlic and halve your lemon. This is the most important step! Pour about 1 tablespoon of olive oil onto your (clean) hand and sprinkle salt on top. 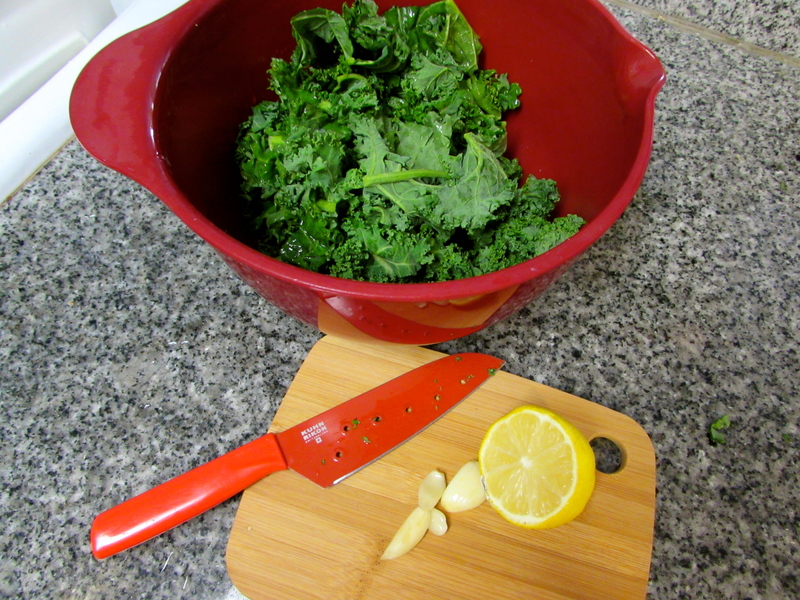 Rub your hands together and massage the kale. This removes that bitter taste from raw kale. In a small bowl, mix together your olive oil, mustard, lemon juice, garlic, salt, onion powder, and pepper vigorously until well combined. 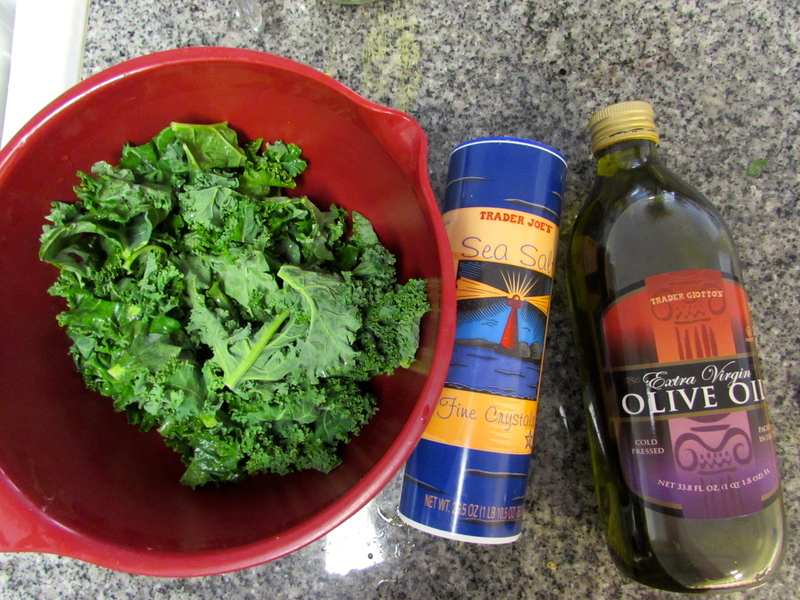 Pour on top of the kale and toss well. I opted to add hearts of palm into my salad. Is it weird to say hearts of palm is my favorite food? There you have it! 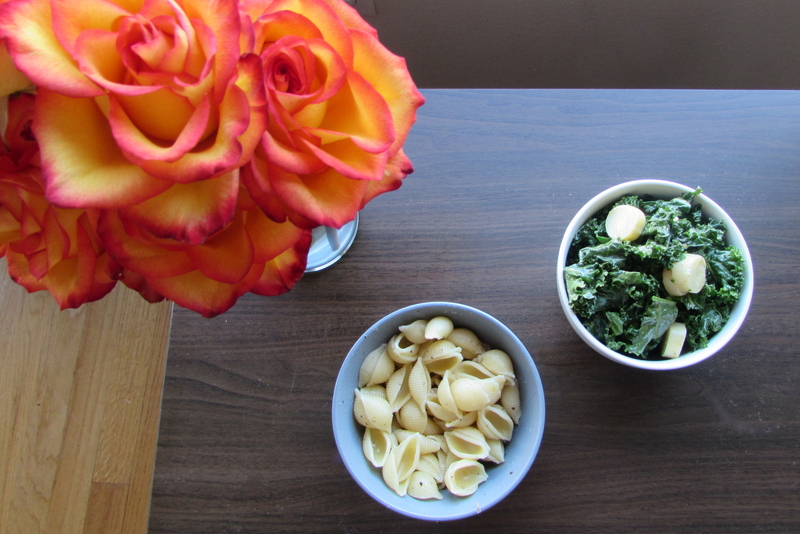 Incredibly quick Meatless Monday dish. I served mine with buttery herb pasta. Meatless Mondays are back again this week! 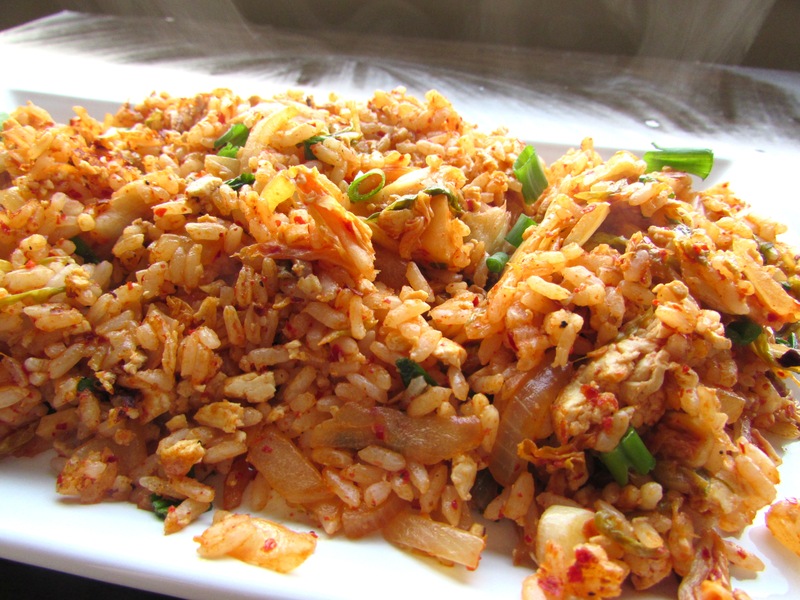 Incase you missed it, last week we shared Hearts of Palm Tacos, and today, another favorite, fried rice two ways. 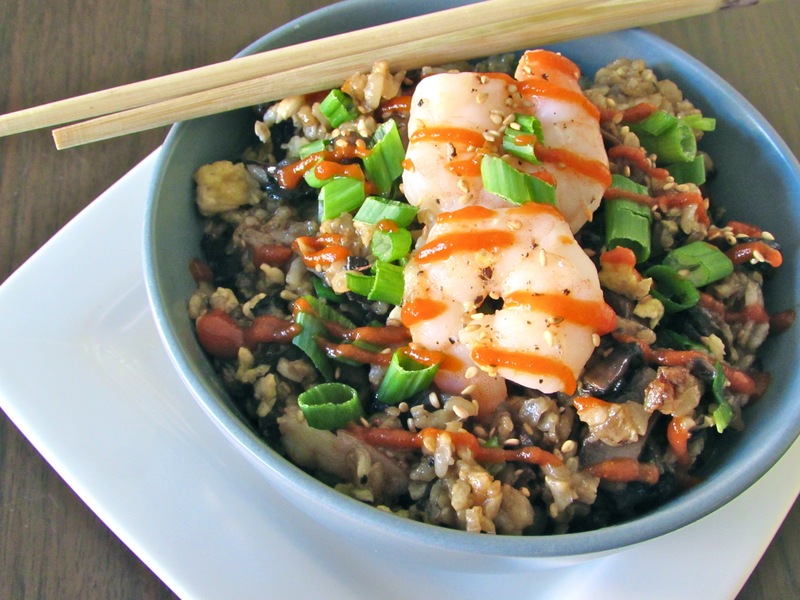 Fried rice is the perfect Monday meal, fast, filling, and there’s usually plenty leftover for lunch the next day. 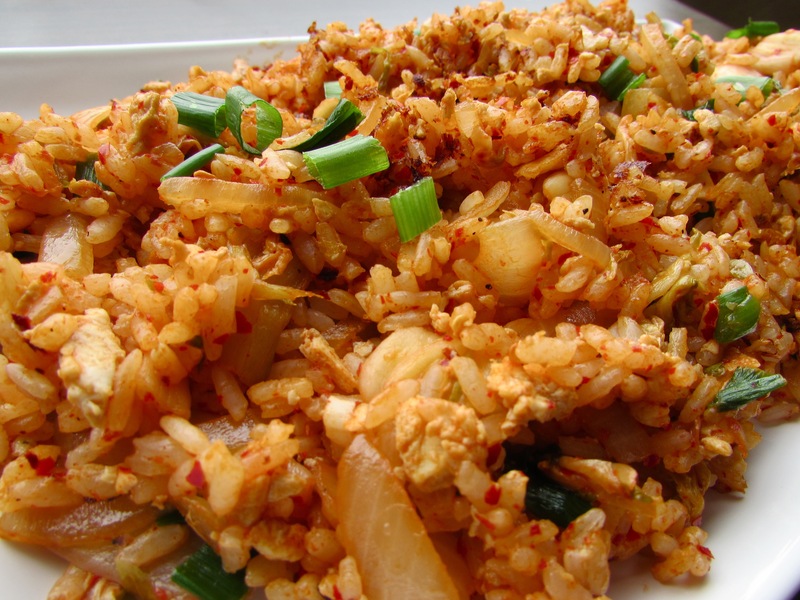 Fried rice is such a versatile dish, you can throw almost anything in and be guaranteed to have delicious results. 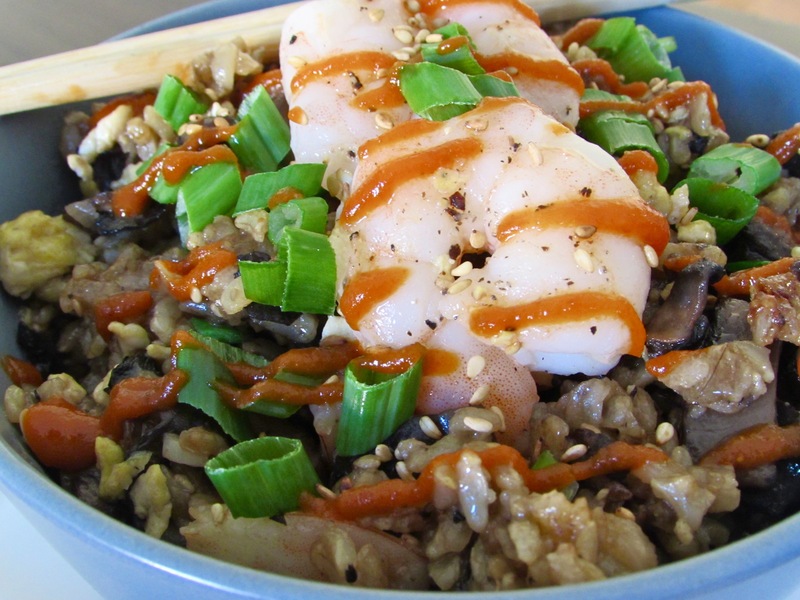 This week we put together a pescetarian Portobello Fried Rice with shrimp, and a vegan Kimchi Fried Rice. Both meatless, both savory and delicious for any diet, and both can be used as side dishes or your main course. Hit the link below to get cooking! Click the Continue Reading link below to get started! It seems that with cooler weather comes more hearty, substantial food. San Francisco has been feeling extra blustery lately, and these biscuits make a great partner to a fall soup or even a pasta dish. 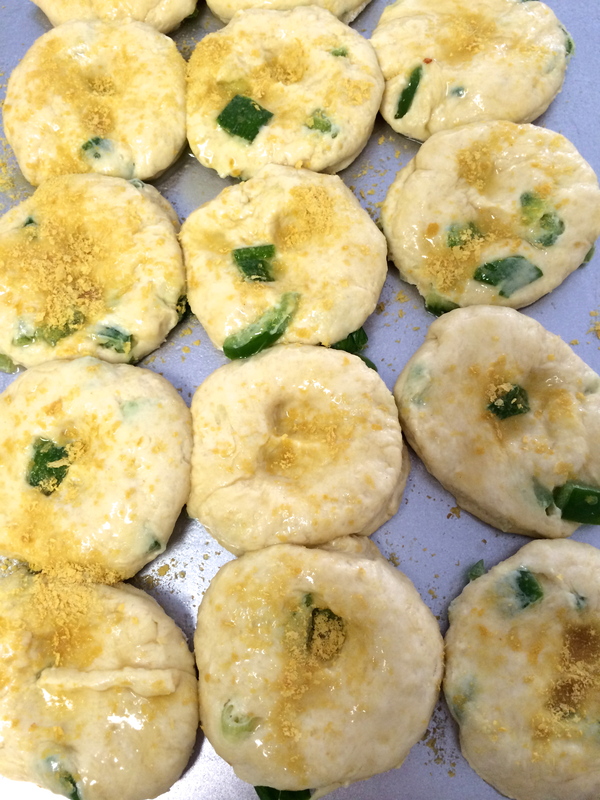 They are so tasty you can even eat them for breakfast- with an egg or tofu scramble and some veggies. 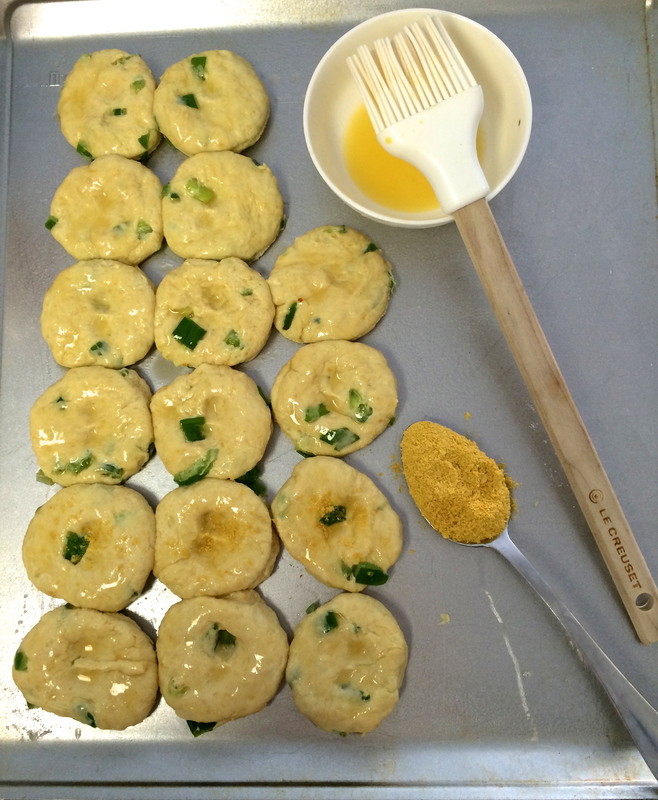 Jess’s jalepeno-scallion cheesy biscuits would go great with a vegan chili or your favorite pasta. 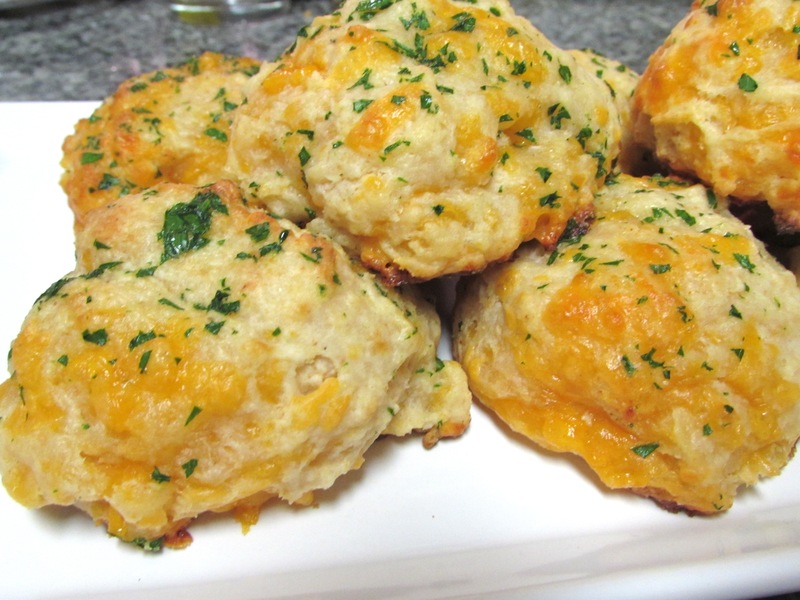 Also, Nikki shows you how to make a cheddar buttermilk biscuit reminiscent of an American classic, Red Lobster Cheddar Bay biscuits. Both recipes would make great additions to most dinners. In fact, they may not even make it to the table! 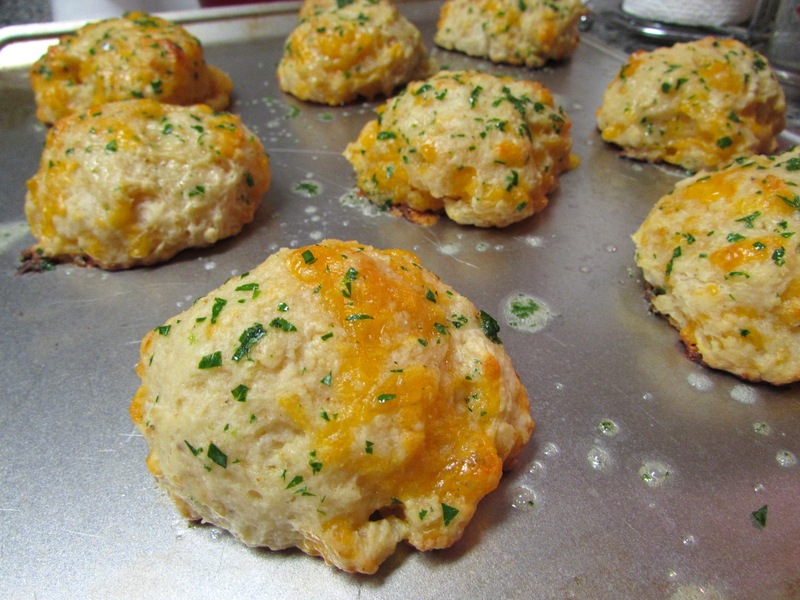 Click the continue reading link below to see delectable biscuits, two ways! Given our namesake, it is only appropriate that we share our favorite brussels recipes with you. 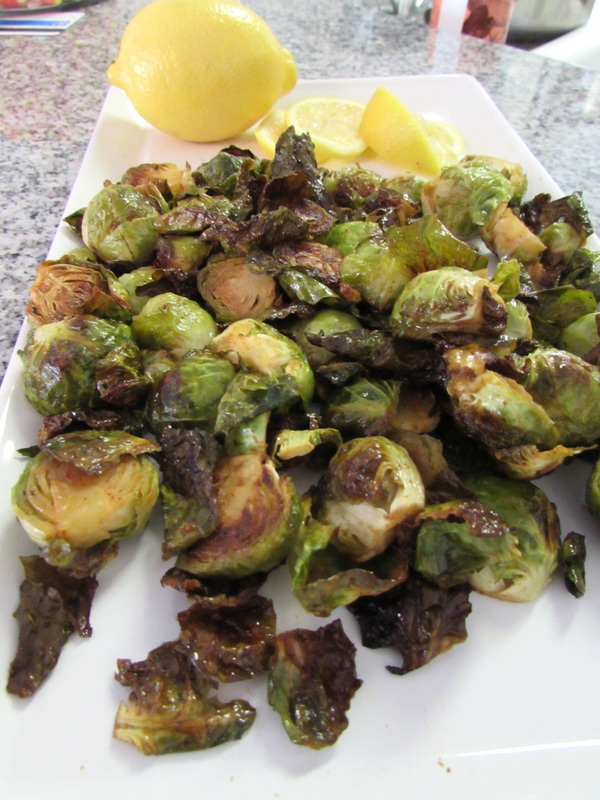 Brussels sprouts are a staple in our house and offer rich nutritional value as well as delicious nutty flavor that both vegans and omnivores are sure to love. 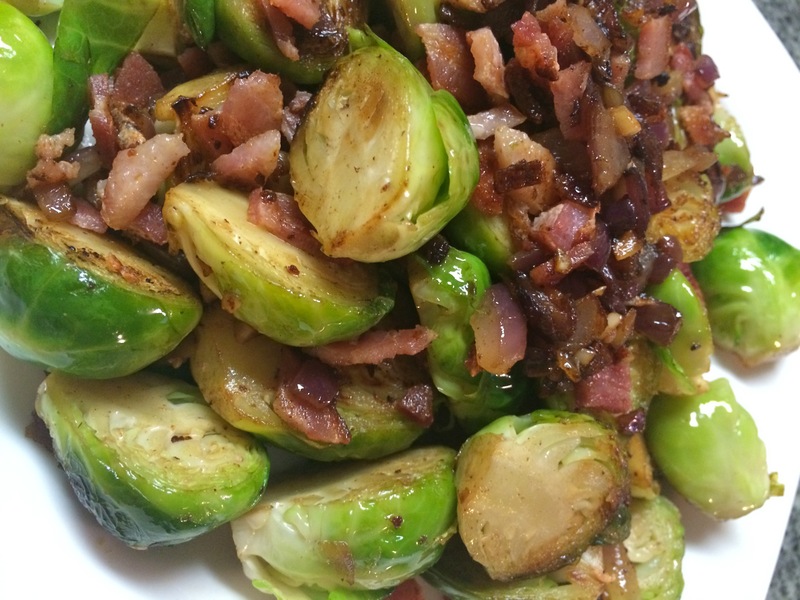 Jess prefers her brussels sprouts with a hint of lemon and a spicy kick, while Nikki prepares hers with every carnivore’s favorite: bacon. But even if we’re pressed for time during a busy work week, brussels sprouts can still be a quick and healthy side dish. 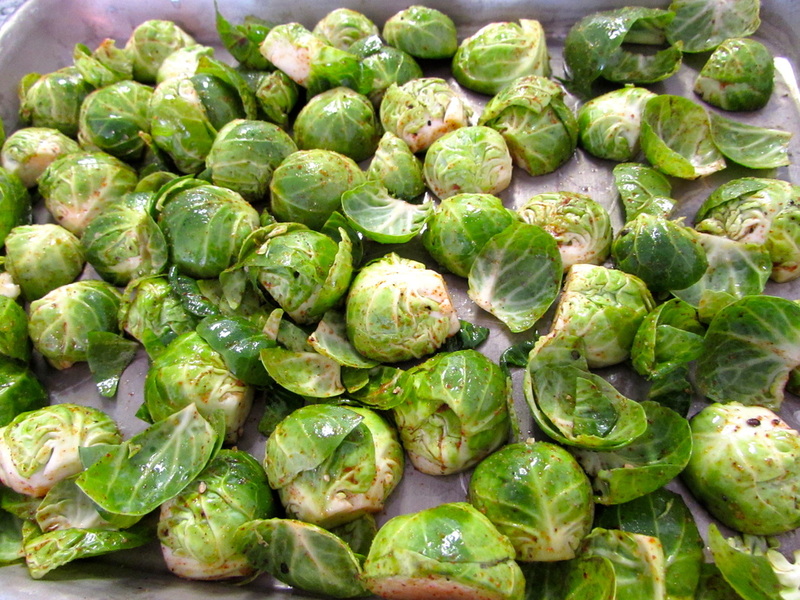 Just drizzle the brussels with a little olive oil and salt and pop them in the oven (at 400 degrees) for 35-40 minutes. 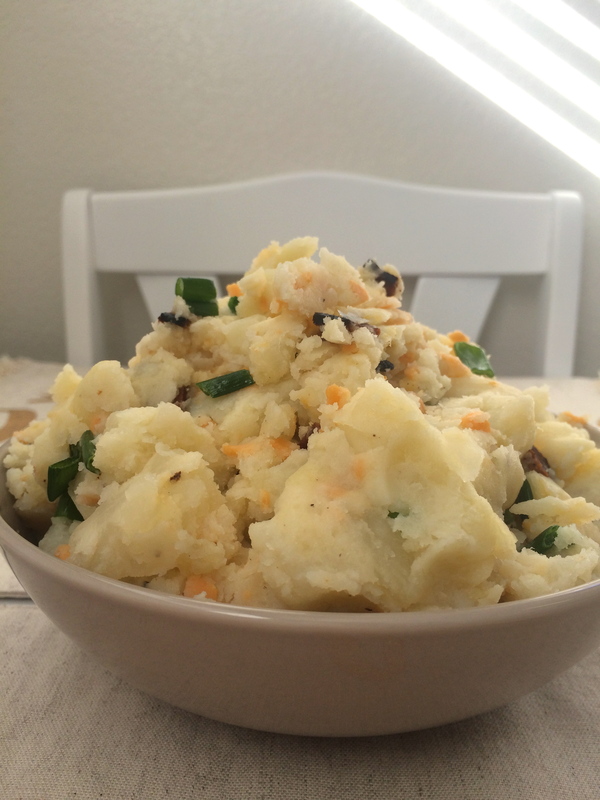 If you’re in the mood for something a little more adventurous, click the Read More link below to check out our favorite preparations of this hearty vegetable. 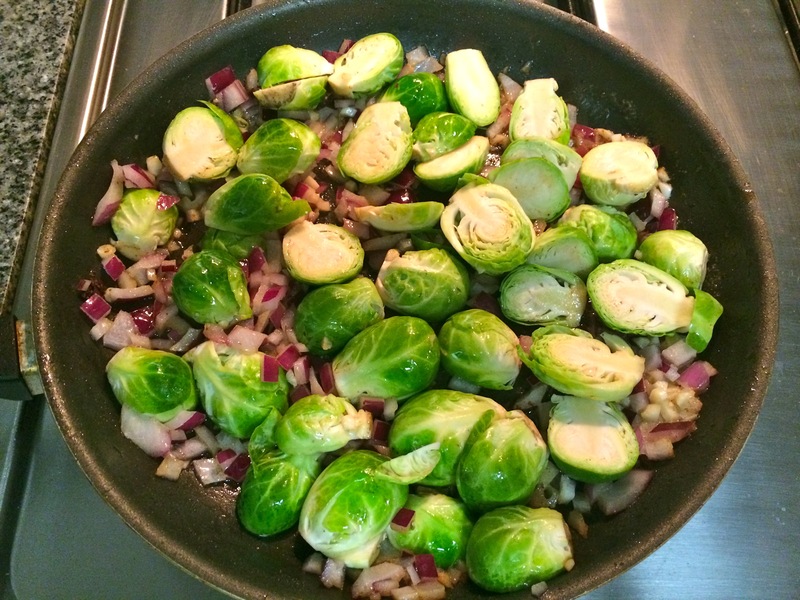 Click the link below to read about our favorite ways to prepare Brussels!